Over the last 15 years I have had some wonderful experiences joining boards and service clubs. The work they do on a variety of issues from support for children’s art and recreation programs, poverty fighting, mental health advocacy, environmental protection, politics, community building, business networking and even just social opportunities is nothing short of astounding. The younger adults I know who do actually commit to service clubs, do so proudly, but most of them were introduced to the values of their club by their parents who were also members. The number is dwindling. When it comes to board memberships, it seems to me that those of us younger adults who serve, do so on multiple boards. We’re the usual suspects and that needs to change. I love the dedicated Gen X and Gen Y folks I meet on boards and executives, but I want to see more of us. We have to turn this tide and if we don’t, the generations ahead will lose something very valuable to our communities. The twenty and thirty somethings are there, but not as there as we need to be. Let’s correct that and let’s start with some education. This is what Brant United Way’s GenNext group was in part designed to do. 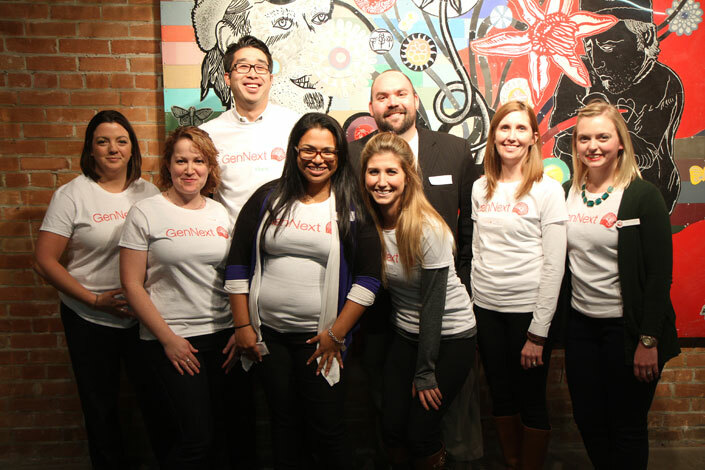 GenNext works with the Brant United Way and its community partners to get people in their 20s and 30s involved in the general community. We work with others to provide opportunities that make sense for this generation to help out with volunteering, giving and action. All the while, GenNext has been generating awarenessabout social issues in Brantford, Brant County and Six Nations of the Grand River. The opportunities GenNext has had to link young adults in our community to the issues important to them in just under a year of activity is astounding. One of those opportunities is coming on May 6th at 6:30pm at the Brantford Public Library Auditorium. In partnership with the Brant United Way and GenNext I’ll be part of moderating an evening workshop-type event for us 20-30 somethings that will help teach us a little bit about how to get started contributing to boards and service clubs. There will also be an opportunity for mentorship by some long-time board members from our community. I really hope you consider attending this free event and learning a bit more about a very satisfying experience. E-mail gennext@brantunitedway.org to learn more and to register for free. I’m sure you have some questions. Below I have reworked some information about boards and service clubs I was able to share in a previous edition of this very publication. Consider it a Boards and Service Clubs 101 primer. We at the Brant Advocate are happy to re-publish these helpful tips again. The last time we did we received a great deal of correspondence from young professionals letting us know they dipped their toes into volunteering in this way after reading it. We hope even more people feel empowered to do so now. A service club is a voluntary non-profit organization. Members meet on a regular basis and perform charitable works through volunteering in their communities and/or by raising money for worthy causes. Examples would be groups like Kiwanis, Rotary, Shriners etc. According to Volunteer Canada, just about every non-profit organization is governed by a board of directors who ”are responsible for providing leadership and strategic direction to [an] organization based on the organization’s mission/mandate; and governing the affairs of the organization on behalf of…its members.” Most boards ask for at least a one-year commitment. Some ask for a longer term of 2-3 years. Most boards also have a limit on how many terms you can serve. What drives volunteer and non-profit organizations is the knowledge, resolve and work of dedicated individuals like you. There are many boards and service clubs right here in our community that are itching for someone like you to help provide input, support and guidance to their work. You might think you don’t have anything to offer but you are wrong. Board members are invaluable and there just aren’t enough people willing to step up to fill the vacancies of many local and worthy organizations. You might be able to help with the day-to-day operations, partnerships, policy development, fundraising and direction of a not-for-profit. Most boards and service clubs can appoint new members who are interested to fill a vacancy as soon as their next meeting. Most usually have monthly meetings but take a month off in the summer and another near the winter holidays. If you know of a board you want to join, just get in touch with the organization and ask. Maybe you have a favourite not-for-profit. Call them and ask if they have any vacancies. Keep reading this article for the websites of some organizations I’ve been fortunate enough to volunteer for and can personally vouch for. How will I find the right fit? A very good question! It depends on what your interests are but I can confirm that you won’t ever find it by staying home. If you aren’t feeling “it” after a few months you can resign. It happens, but in order to prevent poor fit perhaps ask to meet with members of a board before signing on, or even ask if you can attend 1 or 2 meetings as an observer. Interested in being a part of a not-for profit board? If so see the helpful links below. Boards can be intimidating – especially if you are young and new to this kind of volunteering. There will be things you don’t understand at first. There will be people who have been there for years. There will be people from all walks of life; some experts in their field, some with many letters behind their names, and a lot of accomplishments behind them. You have something to contribute. You have a point of view and a perspective that perhaps hasn’t been heard on the board you have decided to join. You also have a fresh perspective exactly because you are new. Don’t underestimate this. Fresh eyes are needed everywhere. 2. Jump in with both feet. This is really the best way to start your commitment. You will learn as you go, and it will help your self-esteem. Take on a project, or offer to do something that has been needed to be done for a while, but has yet to be finished. You are new. Expectations won’t be so high yet, and chances are you will motivate other longer serving members to rededicate themselves. Jumping in is contagious and it will help you feel productive early. 3. You might get confused so ask questions, lots of them. People will be happy you are there. Most boards don’t have an extensive orientation and there will be things to catch up on. Remember, you will have to vote on issues before the board, so make sure you ask questions about anything you don’t feel comfortable voting on. Most boards hold a measure of liability, so make informed choices and ask those who have experience to share it with you. 4. Avoid making alphabet soup. Warning, a board or committee meeting can sometimes be filled with sentences like this: “We talked with the GBHB and the CCQN about the 147 that we had in 2010 and it is looking like to secure funding we’ll have to fill out two separate CQR forms and touch base with the people at NHQ to get approval ahead of LICO season.” If you had as much trouble following that as I did, then you are not alone. Sometimes long standing boards can begin to sound like a verbalized alphabet soup when they get on a role. It may feel like you are being annoying asking those who speak this way to explain what the acronyms mean, but it is important. Further, when you know what the acronyms stand for remember not to use them when newer people than you join up. Respect the time of those who are volunteering. If you find that meetings drag on with side conversations, ask or volunteer to be a time keeper. I’ve done this myself several times on some of the boards I have volunteered on and while it may be an adjustment at first for everyone involved, people do appreciate it. By the third meeting it becomes second nature and by the eighth meeting, it tends to get ignored a bit but stick with it. There is something wonderful about a meeting that ends on time…or even the wonderful and rare Narnia that is Ahead-of-Time-ville. Bring a friend with similar interests. Just like working out, you are more likely to do this if you commit to doing it with a friend. As a bonus, you’ll find that you’ll get to spend more time together. I’ve been really lucky to have had many opportunities in my adult life to have great friends from as far back as high school decide to join boards I’ve been on. It’s a great way to double up community service and quality time with old friends when you have limited time, plus it feels good to volunteer. You’ve joined the board but you find its missing something or someone. Seek out people in the community that might have the right skill set to fill the hole you see. Maybe your board is filled with process people but needs more of those folks with hands-on experience? Or, maybe you have lots of project minded people but no one who digs process. Head hunt and find what you are looking for. What is the worst case scenario? Someone says no but are honoured you thought of them. 8. Bring up your concerns and your ideas. As a board member you have a responsibility to do this. Bring up ideas, shake things up, and don’t be afraid of conversation either. Just remember, a board is a group who must come to decisions as a group. Don’t be so attached to YOUR idea that you aren’t flexible enough to accept that even your idea can be improved. Likewise, if someone has a great and well-meaning idea, but you have concerns with it, bring them up! Do it in a respectful way, but do it. No point in biting your lip and letting things boil over later. Get out in front of it. Fight about it if you are passionate, but remember to fight fair. Seek out creative solutions to complex problems. Perhaps insist that your new group shake things up with a warm up activity once in a while. Know a guest speaker you might want to have liven things up? Invite them for a brief chat at the beginning of a meeting (with board approval of course). Don’t be afraid to be aspirational – by that I mean have semi-regular brainstorming sessions or visioning sessions. Update your mission, vision, values, and look when needed. Why stagnate? 10. Grab a beverage after. Remember that part earlier about side-conversations? Save them for the cafe, the bar, or your favourite Hortons, after the meeting. This is where you make friends, learn more about the people you’re volunteering with, have some of your most creative ideas, and unwind. You may not always be able to do something social after, but make an attempt when you can. I’ve met many folks on boards and service clubs that have become valued personal friends because we spent an hour together shooting the breeze after meetings. When you’re not feeling motivated, these opportunities keep you going and participating. If you do this, invariably you will be glad you did. 11. If it isn’t the right fit, keep trying. You’ve put some time in and it just isn’t working out. That’s ok! It happens. How many of us meet a life partner on our first date ever? How many of us find one job when we are a teenager that we stay at until retirement? Sometimes it just isn’t the right fit and most likely that is no one’s fault. The dynamics just sometimes don’t work out, the schedule doesn’t fit, because of changes in your work or family routine, or maybe the mission of the organization wasn’t what you thought it would be. No matter. Keep trying. If you are committed to your community, you’ll eventually find something that is the right fit. There are lots of opportunities out there – don’t quit when you might just need to try something else.